Personalized forest and white 44” arc barrister auto – open folding umbrellas are sought by marketers with green business interests and are loved by most people due to its electrifying combination. 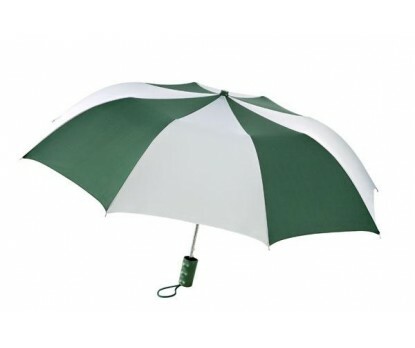 Promotional forest & white 44” arc barrister auto – open folding umbrellas make a good branding and acknowledgement gift in all seasons. Features: plastic handle with carrying strap, auto – open function, 44” forest & white canopy arc and metal shaft. Dimensions- 44", folds to 15". Imprint area – 9 ¼ “W X 6 ¼” H X 6” top.